Timko provides the basic collection of chant for the three main sevices in a compact short format. To this he adds a short section on extra liturgical hymns at the end. This seems aimed as a “handbook” format of the most common material. The book is in Latin Translitterated Church Slavonic in standard western music notation single voice. 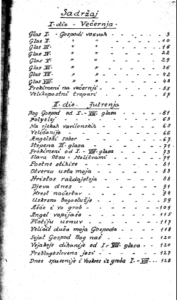 The scan is from a photocopy of the copy in the Saint Cyril & Methodius library collection. The tranliteration scheme uses the hard “g” traditional among the Russian speaking population instead of the “h” usually used in the Rusyn community for the third letter of the Cyrillic alphabet. 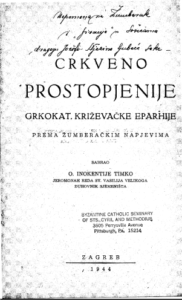 The Timko edition is essentially Serbian Pojanje chant with a number of prostopinije insertions from the Rusyn tradition. 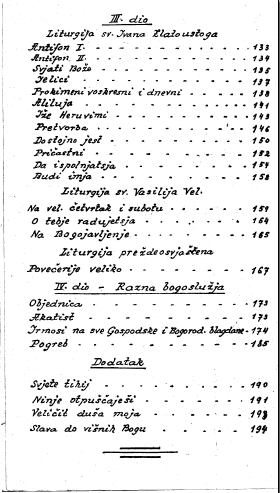 The Rusyn material includes the Svjite Tichi and Great Doxology. You will also notice the fourth drop in Tone 1 instead of a minor third as in the Rusyn chant. 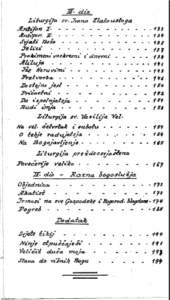 This is standard for Serbian pojanje, like in Mokranjac in the troparia and other hymns. Timko, Inokentije. 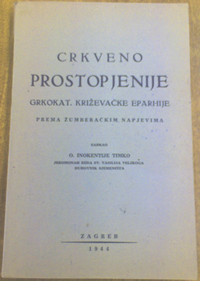 Crkveno Prostopjenije : Grkokat. Krizevacke Eparhije Prema Zumberackim Napjevima. 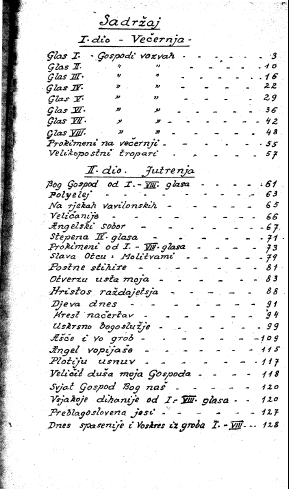 Zagreb: Eparhije Zumberackim, 1944. Soft Cover 6″ wide by 9″ high. Western music notation with Transliterated Church Slavonic text. >The tranliteration scheme uses the hard “g” traditional among the Russian speaking population instead of the “h” usually used in the Rusyn community for the third letter of the Cyrillic alphabet. 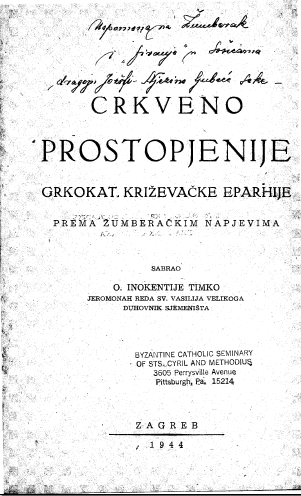 I am pretty sure that the use of “g” in Timko was according to the Croatian pronunciation of Church Slavonic, not any Russian influence.